Greetings, Stampers! This week at The Paper Players, the sweet and wonderful Laurie is our hostess and she has an awesome sketch for our inspiration. I love a tag on a card! I had an idea right away, though my card kind of morphed a bit. Let's just say I used some creative license! I started with a tag die from Clearly Besotted, and then searched for some images that would fit nicely. I chose this Color Layering Wreath from Hero Arts. The tag was a little too big for the landscape orientation so I made my card in portrait instead. The second tag beneath was cut from gold glimmer paper and the banner from vellum. I wanted to keep my background white but it looked a bit too plain so I added some texture with a stencil and some embossing paste. I'm pretty pleased with the end result. I also made a second stand-alone tag so that I could play along with Tracey's 25 Days of Christmas Tags challenge. They are already up to day 20; where have I been?! I've wanted to play since day one and time is passing just too quickly. I hope to squeeze in one more before it's over. I was inspired by Tracey's tag with its green wreath and red bow, and also Lucy's tag with its layer of gold glimmer beneath, both on day 13. Check out their Pinterest board; it's pretty awesome! I thank you for stopping by to pay me a visit today, and I hope you'll visit the rest of the Design Team at The Paper Players! Please play along with our challenge this week, too! Sandy, this is stunning. I love the snowflake background with the pop of green of the wreath. This is really CAS perfection! This is my favorite Christmas card yet this season! Great job, I love everything about your stunning card! 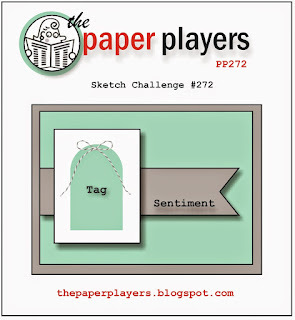 I love what you did with the sketch challenge design Sandy! Your card is so classic and beautiful! Great elements, colors, style, happiness! Thank you, Sandy, for all of your encouragement and support and kindness throughout my journey as a guest designer with The Paper Players! The six months flew! I can't believe it is almost over. I will sure miss being a part of it! Happy Thanksgiving week! Great take on the sketch, Sandy! I love your cute wreath,very festive! I'm really into wreath cards this season...one of my favorites for a Christmas card. Have a great day! The pop of color from the red and green is so pretty! And I like the elegance the gold brings. Just lovely!! Gorgeous....love the traditional red and green against the white, so fresh and Christmasy! Love your wreath! 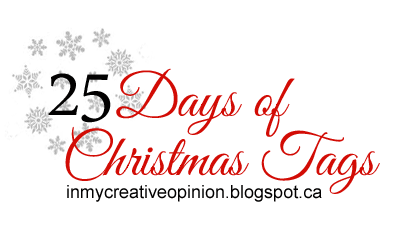 Thank you for linking up to the 25 Days of Christmas Tags! Good luck! I love this Sandy - your pops of red, green and the gold tag look fabulous against the white and I think the texture of the embossing paste snow is gorgeous! What a fabulous card! Such a beautiful, festive Christmas tag. Love this design.